KATHMANDU, September 1: Unsettled by Nepal Republic Media’s crusade against rampant corruption, Nepal Oil Corporation (NOC) Managing Director Gopal Khadka has filed a defamation case against Nagarik Daily, claiming Rs 800 million in damages. Court officials served notice of the defamation petition filed by Khadka on August 17 at Kathmandu District Court, to Nepal Republic Media (NRM) Thursday. The petition has named NRM Managing Director Binod Raj Gyawali, Director Shobha Gyawali, Nagarik Daily Editor-in-Chief Guna Raj Luitel and correspondent Dilip Paudel as defendants and claimed Rs 200 million from each in compensation. This is probably the biggest defamation case against any publication house in terms of the amount of compensation claimed. Nagarik and Republica dailies have been running a series of investigative stories on corruption involved in the procurement of land by NOC in various parts of the country. The dailies have also been running stories based on the findings of parliamentary probe committees and the ongoing surveillance by the anti-graft body, Commission for Investigation of Abuse of Authority. Khadka in his petition argued that instead of rewarding him for the good work he had tried to do, his image was tarnished by the defendants . He claimed that he was insulted by the running of stories on multi-million misappropriations involved in the procurement of land meant for building NOC storage depots. Khadka has claimed that although the media reports under different headlines tried to substantiate misappropriations by him, the reports had all been proved false. 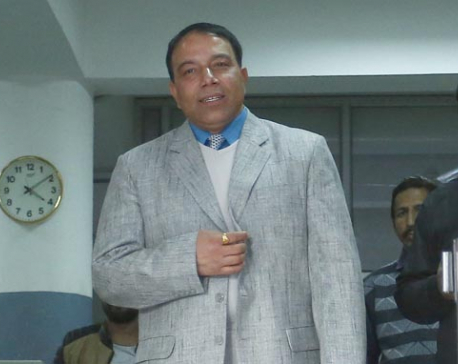 In his court petition, Khadka has claimed that he had tried to bring competition to the fuel market by breaking up the monopoly of certain individuals. Commenting on the case filed by Khadka, former president of Nepal Bar Association and senior advocate Shambhu Thapa said that in this incident the media is facing an organized attack for writing news. “The case has come about in a planned fashion against news writing. This indicates that state agencies need to be vigilant enough to protect the media’s right to freedom of expression,” he said. Former registrar at the Supreme Court Ram Krishna Timilsina said Khadka has tried to save himself from the allegations he faces publicly by filing a petition against a media house. “This issue was not raised by media alone. Besides Nagarik, other media have also been running the story. The Commission for Investigation of Abuse of Authority has also been raising this issue. It is the right of the media to publish truth about issues of public importance,” said Timilsina, who is also an expert om communications laws. Timilisina said that defamation law is attracted only if fictional stories are published to harm the public image of individuals.